It’s evident that social media is altering the communication landscape. And while Lady Gaga, Justin Bieber and Katy Perry are busy building their Twitter empires (with more followers than the entire populations of Germany, Turkey, South Africa, Canada, Argentina, United Kingdom and Egypt! ), 2 they don’t have FINRA, the SEC or other regulatory entities outlining a series of rules regarding what they can and cannot say — and watching to make sure they follow the rules. While the early adopters in the Twitterverse are sharing, connecting, and even landing new clients, many advisors sit on the sidelines. Why? Because of risk. Risk is the elephant in the room. Some advisors are jumping into the arena without a clear understanding of the requirements. Others avoid social media altogether, since they aren’t willing to spend the time required to understand the regulations and outline a plan to succeed while sustaining a compliant approach. There are many ways to manage a social media presence in a regulated environment while keeping risk to a minimum. In this post, I’ll outline the major guidelines and rules for participating in social media. Static content, such as profile pages on Facebook, LinkedIn and Twitter, requires pre-approval, as does all advertising content. Interactive content, such as updates, must be monitored and archived. Supervision and archiving can be provided by a third party. Blogs are considered interactive content. They can either be pre-approved or supervised. Twitter is considered a micro-blogging platform. However, while tweets do not have to be pre-approved, they must be archived and monitored after the fact. Is compliance getting in the way of your social media? 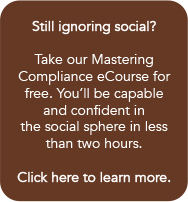 Take the Mastering Compliance eCourse and get your social sales rolling! Making investment recommendations on social media sites is just messy. Don’t do it. Social media is an avenue for broad distribution of content, and will trigger the suitability requirements of FINRA Rule 2111. Watch out for any promissory language, unsubstantiated claims and ratings. You don’t want to make it onto this list: The Top 5 Corporate Twitter Disasters of 2012. Finally, let’s discuss third party content. Social media is about sharing. In fact, posting only original content is actually a social media faux pas. In terms of regulations, sharing third-party content can be tricky. Advisors need to understand that they are held liable for the content they link to in their updates or posts. 6 Be aware that your firm will be held liable if you know or have reason to believe that the content you’ve shared contains false or misleading information. This all feels overwhelming and even a bit more risky. How can advisors use social media outlets while staying within the regulations? Actually, there are many ways. Stay tuned — in the weeks and months to come I’ll be sharing some simple ways for you to establish a social media presence to help market and grow your business.